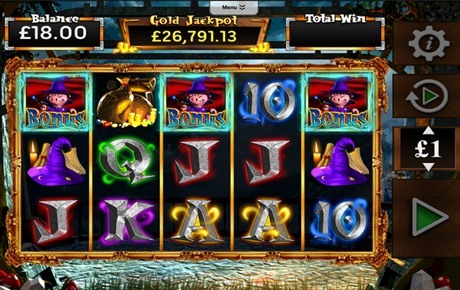 The Pig Wizard game is a 5-reel 20-line slot with a mystical fantasy theme. The game has 2 exciting, interactive features as well as a Free Spins Bonus with WILDs and Magic Mirrors and a Progressive Jackpot. Wild: Wild icon (Pig Wizard Wild) substitutes for all symbols except scatter. 3 Bonus Scatter symbols anywhere on reels 1, 3 and 5 awards the Mystical Map Bonus. Revealing Free Spins awards the Magic Mirror Free Spins. Revealing Trail of Magic awards the Trail of Magic Bonus. Revealing Squeal or no Squeal awards the Squeal or no Squeal Bonus. Revealing Bonus Cash Prize awards a Mystery Win. Revealing the Progressive Jackpot symbol awards the Progressive, before allowing the player to choose from the map again to reveal a Feature. Reveal Magic Mirror Free Spins during the Mystical Map Bonus to start the bonus round. Free Spins are played on enriched reels, featuring the special Magic Mirror symbol. During any spin if a Magic Mirror symbol appears in view a symbol in chosen at random and revealed in all mirrors in view giving more chances to win big! Roll the dice to move around the board collecting multipliers, potions and crystal balls. There are 3 potions on the trail, each with a different effect. GHOST creates a mystical version of the Pig Wizard which moves around the board as you do, collecting multipliers and potions. If the poison bottle is filled with the Ghost active then the ghost is killed along with the Pig Wizard. MYSTERY ADD can increase your current win as well as upping the values displayed on the board. Land on a crystal ball to see the future which reveals a mystery outcome! Continue moving around the board to try and win magical prizes. If the poison bottle is filled then the Pig Wizard is turned into a Frog and the feature ends. Select a Book to reveal a cash prize. Press SQUEAL to collect that prize or NO SQUEAL to pick again. The feature continues until the player collects a prize or has selected 5 books. Revealing the Progressive Jackpot symbol during the Mystical Map Bonus awards the progressive jackpot, before allowing you to choose from the map again where you are awarded your Feature as normal. The Progressive Jackpot is available on any stake, with 4% of the stake being added to the Progressive Pot. When the jackpot is won, it is reset to the "seed" amount and begins to rise again.